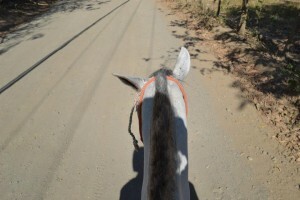 After a 7:00am Tico style breakfast at the hotel we headed out to Sámara for our 8:00am horseback riding tour – a private excursion with a Spanish-only guide and two horses, Pinto for Danny and Andres for me. There are a few tour outfits in town; I booked ours through a site called Anywhere Costa Rica, but offerings seemed similar across the board. The tour lasted two and a half hours and took us up some tiny dirt roads that afforded beautiful views of the ocean and coastline, as well as along the beach itself, which was lovely. We were both novice horseback riders, so there were some tense moments whenever we descended down the steep dirt roads and whenever the horses broke into anything more than a trot. But for the most part, Pinto and Andres were quite docile. After the tour ended we immediately rushed to the organic café where we ate lunch the day prior and downed a cold drink. Only 10am and the sun was already beating down. 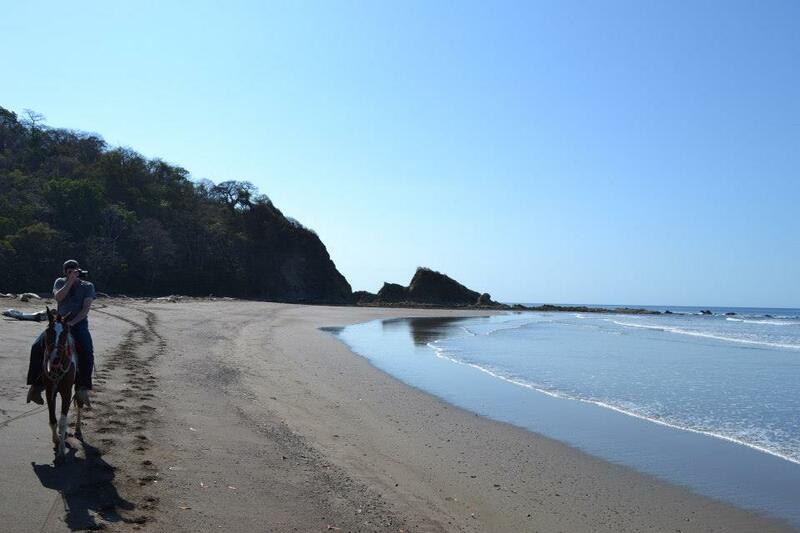 The next hour and a half was spent relaxing on the beautiful, serene Playa Carillo. The warm, clear seawater was inviting, and amazingly we had the beach almost entirely to ourselves. We enjoyed the peaceful surroundings until our minds began turning toward lunch, at which point we got back on the road and headed south to our destination for the evening, Montezuma. For those of you traveling south on the Nicoya Peninsula to Montezuma: beware. The road is not an easy one. Not long after heading out we came upon a river whose bridge had either never existed or washed away. Either way, it forced us to take the longer road to Punta Islita, setting us back at least an hour’s drive to get to a location that should not have been so far away. After a lunch break in Punta Islita it was on to Montezuma via two plus hours of tough roads and unexpected river crossings. What do you do when the road to the next town is suddenly intersected by a surprise river? You exchange perplexed looks with your traveling partner and figure out the best way to soldier on. It wasn’t an easy trip, but it wasn’t boring either! We arrived in Montezuma a little after 5:00pm and found our hotel. The property was nice — right on the beach with green lawns dotted with hammocks – but the rooms themselves were nothing great. Montezuma was a bustling little surfer town/hippy hub that appeared to be a popular stop for many young travelers. Getting a hotel there isn’t easy, so if you go, book early. It seemed to have a cool vibe, but we didn’t stay long enough to get a real feel for it. After a meal in town (I had a dish with tofu, which speaks to the clientele that pass through the area) and some stargazing we called it a night. Next stop: Manuel Antonia National Park. But first, a ferry ride to get back to the mainland.